You get into a crash. Perfect. Just your luck, you say to yourself. But then you decide not to get the help of an attorney for your woes. Mistake. Do not trust in the insurance company. Here’s why that’s the case. An insurance company’s main concern is purely profit. It motivates and drive them. When your car insurance company refuses to pay you, your case may be going against their interests in making them more money. After all, it’s no wonder why insurance related search terms on Google are more expensive to bit at. It’s a business. Profits motivate people and they find happiness in helping others in their tough times. Some other people seem to be motivated by thoughts of threat and harm coming to them or their business.Insurance companies are mainly concerned with profit, however. Meaning that if it is “profitable” to help you, they will, otherwise they won’t. This means you need to be careful about it. It’s not altruism, “It’s just business” ~ Anonymous. Insurance company goals are not altruistic, they’re purely based on what profit they can make, as made abundantly clear. Claims of seeking justice and helping society are plausible, as long as profits are secure. If they’re not, you can bet top dollar that they won’t entertain you. When insurance companies deny your claim and refuse to pay, you need to put something on the table that risks their profits (or reputation). There’s always help for that. An attorney can do it for you because they are aware of the legal implications of what is and isn’t conveyed to the insurance company. To get justified compensation for damages that weren’t your fault, attorneys are a great help. If an attorney believes that insurance companies do what’s right instead of profitable, you need a second opinion, from a new attorney. From a logical standpoint, won’t they be pay for the full extent of damage and losses if they were doing the “right” thing. Sometimes you have to play dirty and threaten to reduce profits so that gives them the motivation to pay you back completely. You can’t do it alone, at times. An attorney with background experience in the insurance industry may cost more, but they have the necessary know-how to get you the best possible compensation. This is the undisputed mantra of insurance companies. They start with denying your claim of losses. For instance, when you get into a fender bander and it’s clear that the other party hit you from the back, the insurance adjuster from that party can make things difficult for you. They can tell you to that the insurance company denied your liability till they gathered information from the insured (the person who hit your car). If you are responsible, then that’s a different story altogether. They either want a statement before you proceed or they will keep delaying till they get complete information from the party they’ve insured. They won’t give you any money till you have a strong case. A case like this is not going to be possible without a professional attorney’s help. If you have been in an accident, do not call the insurance company. 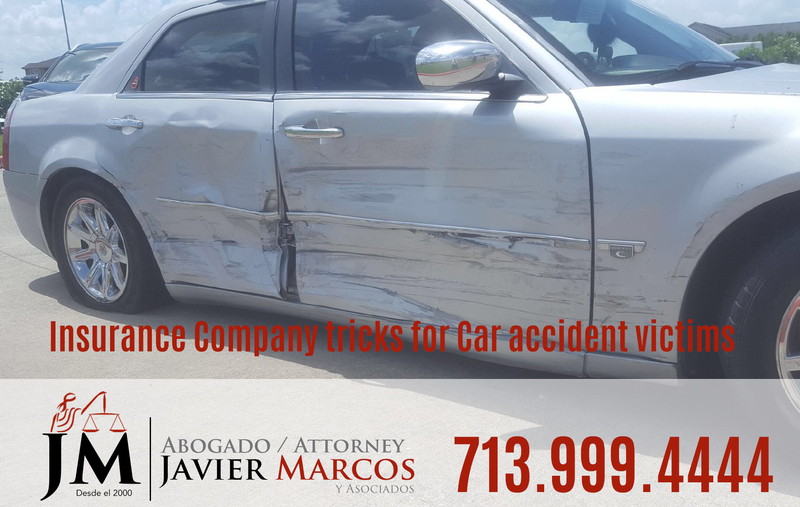 Call Attorney Javier Marcos at 713.999.4444. He will speak with the insurance company. If you call the insurance, then they will ask questions to lower the amount to be compensated. They always try to deny claims or give you the less amount possible. Do not fall under the trick. Call Attorney Javier Marcos now.